When I say pimping I'm talking about what I did to increase speed and usability of my X-Pro 1.
. I have used Gordy's straps on all of my old analog cameras for years. A beautiful camera like the X10, X100 or the X-Pro 1 deserves a beautiful strap. 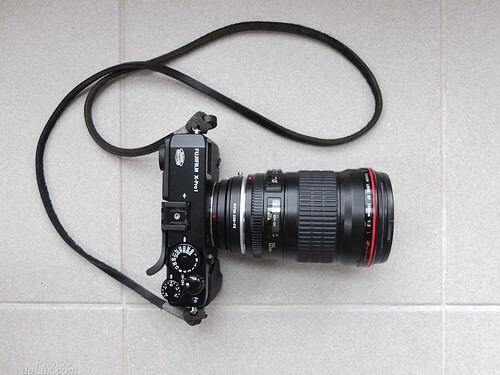 The strap is perfect for the weight of the camera and you can customized the length, color of leather and color of the wrapping cord to individulize your strap. Compared to an entry level camera body the X-Pro 1 is not that much smaller in width and height. But it's much thinner. That's great for portability but not ideal for ergonomics.
. It was about 50% more expensive than the Fuji Hand Grip, but you still have easy access to the battery/SD door. grip especially for the X-Pro 1 that is a bit cheaper, but I have not tried that one. You loose the flash ability via hot shoe (I have not used a flash on the X-Pro 1 so far). And the paint of the grip will wear off quite easily and expose the brass underneath (see photo). If you want to speed up the operations on your X-Pro 1 invest in fast UHS-I SDHC cards! Fortunately Fuji supports the new UHS-I standard and the X10, X100 and X-Pro 1 make use of it. I am using 16GB SanDisk Extreme Pro cards rated at 95 MB/s and have never felt that the cameras operate slowly. The speed will most likely improve noticably even compared to a normal Class 10 card. No matter what SD card you use there is some precaution that you should take with the cards used on Fuji X-Cameras! First of all always format the card inside the camera. Secondly, SD cards come with a little "Lock" slider on the side. Do make it a habbit to switch the slider to "Lock" as soon as you take the card out of the camera and unlock it only right before you put it back into the camera! (unless you want to load a firmware update onto the card). If you don't lock the card and stick it into a Mac or iPad (I don't know about Windows), the OS will add a little file onto the card that gives your Fuji camera the hiccups. The camera will feel totally unrespondsive and takes forever to start. Only cure is to format the card in camera and remeber to lock it next time you take it out. and will soon post about my experience with the Olympus OM Zuiko to XF adapter. Categories: "CSEP-2", "EP-7S", "Fuji X-Pro1", "Fujifilm", "Gear", "Gordy's Camera Strap", "Handling", "Looks", "Maintanance", "Pimp", "Pimped", "SDHC", "SanDisk Extreme Pro", "Speed", "Test", "Thumbs Up Grip", "UHS-1", "UHS-I", "X-Pro 1 slow down"